Puppy collars aren't too expensive, and they're lighter and smaller than adult dog collars. 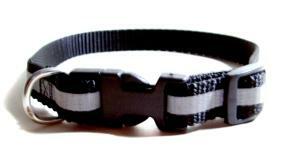 You can get an adjustable or nylon collar which you can adjust as your pup grows. Don't get a training collar for your puppy until he is at least 6 months old. His muscles and bones are growing and this type of collar could hurt him. The collar needs to be tight enough that she can't get it off herself and loose enough to fit two fingers in between the collar and her neck. After your baby turns 1, you can get her another collar. Buckle collars come in leather dog collars or nylon. This can be left on your poodle when you're not around. Flat buckle collars are usually for larger dogs so you can control them. Martingale dog collars are larger with a small loop connecting the collar's ends. Some have an area that pulls out to form a handle. 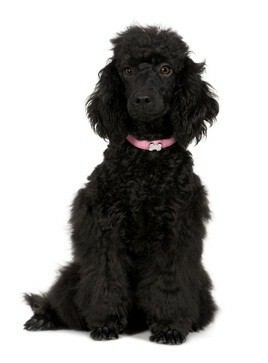 These collars won't choke your poodle as it can't be completely tightened. Yet your poodle can't get out of it. These can't be worn all the time because the small loop can get caught on things or around your dog's leg. Training collars are made from leather, chain or fabric which tighten around the neck area so you can correct her during training. These should be taken off when you're not training her. Your puppy needs a small dog training collar. You'll need id tags for your pet to put on his collar. You can put your name and home and cell phone numbers on a tag. They're inexpensive. Check with your vet or local animal shelter to see if they sell them. Ask your breeder if he tattoos registration numbers on his poodles. Check with your vet to see if he can do this. You can also tattoo your phone number instead of the registration number. If you have it done on a puppy, it could fade or stretch as he grows. Microchips are becoming more popular. A veterinarian puts a very small chip for tracking purposes between your poodle's shoulder blades which is read by a scanner. 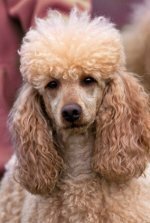 Puppy collars with the proper identification tags can get your poodle safely home if she should accidentally get lost while vacationing or get loose from the yard.